I made French Apple Cobbler and baked it in small heart shaped tin pans for Valentine's Day. I placed the cobbler upside down on a plate and served it with ice cream and hot Butterscotch Sauce. Delicious! The Apple cobbler is making me hungry! Is that your own recipe? Hey Stopping by/following from the stalker hop! Oh yum! and how cute to make them heart shaped too! Looks delicious...my mouth is watering! this is my favorite dessert!! thanks for reminding me why!! 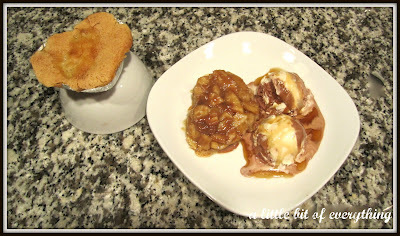 Mmmm I love apple cobbler! Looks delicious! So comforting at this time of year, too! I'm a terrible cook. Jealous! That looks yummy. Visiting you from the hop. well that sounds like a comfort food if I have ever heard of one! This looks heavenly! I have such a big sweet tooth.. this might just satisfy it! Yummm! Ps.. thank you for linking up to my Financial Friday party.. hope to see ya there this Friday!